I have a simple project for you today. It involves bugs and spelling names with stickers. This has been a favorite at our house this week. It requires very little materials and at least at our house, kids will sit and chat with one another and create for quite awhile. I have loved it! Materials Needed: cardstock, scissors, tape, glue, googly eyes, pop cleaners, alphabet stickers, lots of other stickers, and a marker. 1. Make the bug body by tracing a round bowl or plate onto a piece of cardstock. Add an extra little bump for the head. 2. Cut out the bug. For kids 4+ I would just draw the template and have them cut out the bugs themselves. 3. Draw any details with a marker (I drew the closed bug wings). 4. Start creating with googly eyes, stickers, pipe cleaners, and anything else you have on hand and want to use. I don't like to limit googly eyes or pipe cleaners. If a kid wants a bug with 5 antennae, tell them to go for it! Googly eyes and other craft supplies can get expensive, so I let kids use what they want and then afterwards we repurpose the googly eyes and pipe cleaners for other crafts. I have kids tape pipe cleaners onto the bugs because it is quicker than waiting for the glue to dry. 5. Once the bugs are created, we practiced spelling our names. My son can spell his from memory, but if your child isn't there yet, write their name on a piece of paper for them and have them use it as a prompt while they are spelling. 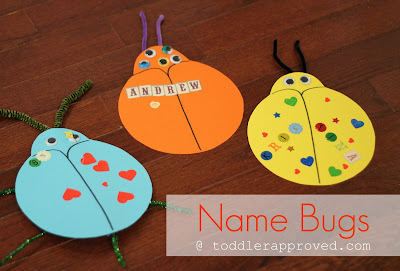 Give your child a sheet of alphabet stickers and have them cover their name bug with their name! They can write it, add stickers for it, or whatever they want to do. Writing and creating with names is a wonderful way to engage children in learning about letters. As they begin to learn more about letters and realize that their names are the same each time they write or create with them, they start to really understand what words are. In addition to being a fun little project, this activity fosters conversation about colors, shapes, textures, and names! Varying the types of materials you craft with will also change up what you talk about while you create. Have fun! Do you have any other favorite name activities or crafts? Stay tuned for a post tomorrow on how to repurpose Valentine's Day cards. Don't recycle your child's yet!